In the second of our series featuring on some of France's top hotels, we take a look at the Château de Sanse - a jewel in the heart of the Girondin countryside. 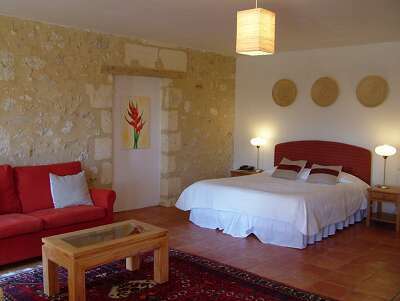 When you finally find the hotel, you’re in a tranquil 5-hectare oasis in the heart of the Girondin countryside. The feeling is less château and more country manor, but that really is a minor point because the lack of castle-esque scale makes the initial impression all the more intimate and relaxing. Having passed through vineyards and rather busy roadways, the setting of Chateau de Sanse feels like your friend’s large house way out in the country. The position is amongst lush, verdant rolling countryside and any major traffic noise is a distant memory. The entrance to the hotel is at the corner of a large courtyard that echoes reverential silence. Well kept gardens are just below the main car park and the terrace offers gorgeous views that get even more gorgeous when atmospherically lit by the setting sun. Despite being in the heart of one of the principal wine-growing regions in the world, there is a wide variety of bucolic views of cattle, vines and crops, with the sight of the occasional tractor pottering along in the distance. Originally a farmstead, the chateau was extended and modified over the last four centuries of its existence. It was a Franciscan monastery (unsurprisingly, given its peaceful surroundings) and was most recently purchased by a British owner, who completely renovated it to how it looks today. It’s not your typical hang-out for A-list celebrities and the owners are very discreet about their guests, but it was intimated that a certain former British Prime Minister has stayed here, as well as a number of well-known French television personalities who prefer to take their luxury sabbaticals with a generous dose of calm and privacy. Oh, and Northern flautist James Galway is another fan. No matter where you are in the hotel, you always feel as though you’re in your own space. The welcome is as unobtrusive as it is warm. The first time I arrived was after a seven-hour drive in the heat and the smile with a glass of cool bubbly followed by sinking into the Pool-with-a-view was precisely what any self-respecting doctor would have ordered. It also helps that the current manager – locally-born Jacky – has spent years working in the hotel industry in Ireland and reserves a special Céad míle fáilte for his Irish guests, asking how things are going “back home”. There are 26 rooms altogether. All are of generous dimensions in an ancient cool stone construction. We had adjoining rooms with a large ensuite and a nice balcony that looked out to the rear. It wasn’t the divine view over the valley (that you can get at breakfast or dinner anyway) but it was still a gorgeous and peaceful view of the hills behind, still giving you the impression that you’re far away from anywhere where people hurry about too much. The restaurant comes with a fine reputation of using plenty of local produce and treating it with respect. We went for some rabbit, which was simply superb. The service is efficient and friendly. Breakfasts are of a high standard for what is officially a 3-star establishment but it’s the dinner service that impressed the most. 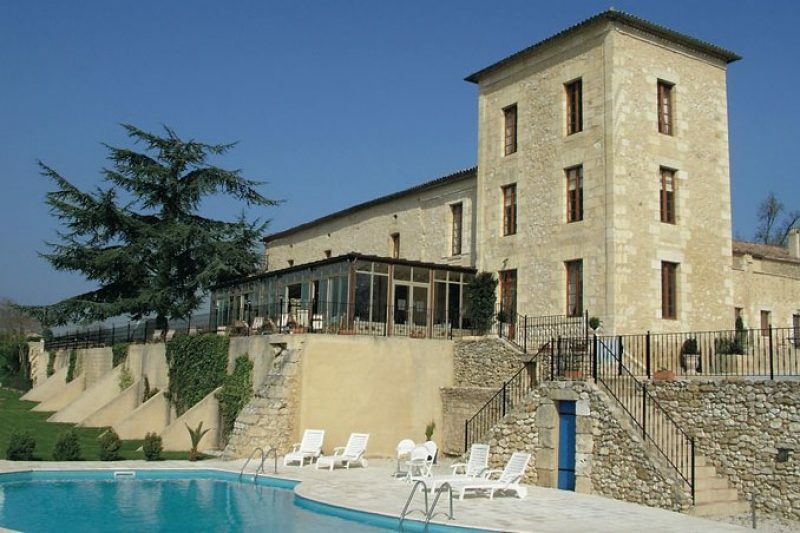 The Chateau de Sanse is in the mid-range in terms of value for money and if you’re looking for a slice of authentic charm in a genuinely rural setting, then this is the place for you. It also serves as a great base for exploring the wine country around here. The astonishingly beautiful wine Mecca of St Emilion is just 26km away, for example, to the north-west. To the south, there are plenty of pretty little villages that are disarmingly and surprisingly (given that this area is often associated with wealth) modest in appearance. Take the village of Castelmoron d’Albret, for example. With its official population of 55 and one catch-all épicerie, it oozes timeless charm of the sort that you won’t find on any tourist brochure. Met a Limerick couple there on the night the World Cup was on two years ago. Mighty place.